After enduring several sleepless nights and going through thick books of different cases, luck decided to show itself to the top Bar passers of the Philippines. For one, their names were scattered recently on different big newspaper companies, websites, blogs and on TV as topnotchers of the 2014 Bar Examination. In fact some were also invited to appear in a local tv show – an experience others like me won’t be able to achieve anytime soon. Then of course there is a very bright future waiting for them. Law firms and companies are now showing their interest to these new lawyers of our country. But it seems luck is not yet done in making them a lot happier. One in particular is fifth placer Michelle Liao, who is set to get a brand new car from her school, the University of Cebu. 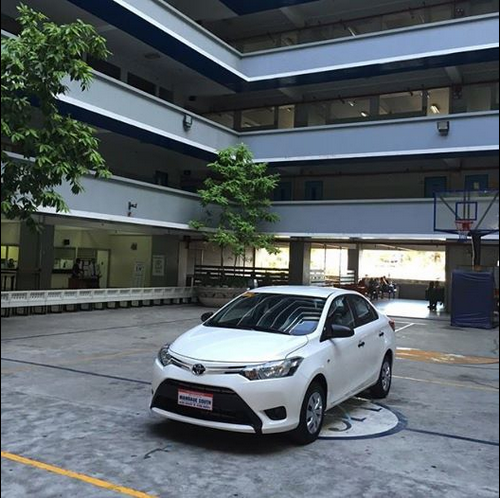 A white Toyota Vios was seen at the quadrangle of the university, ready to be turned over to Liao, who garnered a Bar score of 84.50%. The University of Cebu had promised Bar takers that whoever gets to be included in the top 10 will receive a brand new car. “We really want them to do well. The car is our way of encouraging them to excel,” Candice Gotianuy, chancellor of the university, had said. “It’s both an incentive and reward for our students,” the chancellor also said on her Facebook account.